I don’t know about you but all this salted caramel and salted chocolate trend is old news to me! I’ve had a passion for chocolate coated salted pretzels for years. I always used salted butter in my baking. Why would you want to deprive your taste buds? I can’t claim any credit for this recipe at all as I saw it on the Food Network channel and liked the look of it. It is from a chappie called Andy Bates who seemed to be sponsored by Tate and Lyle. I liked the look of it because I had everything I needed in my cupboards and it looked really straight forward. Plus it has one of my favourite ingredients in it, condensed milk! To make the base, melt the butter and syrup together then stir in the oats. Tip into the prepared tin and press down firmly. Bake for approximately 15 min or until golden brown. Set to one side to cool slightly. Add the sugar, milk, butter and syrups to a heavy based pan. Heat gently, stirring until all the sugar dissolves. INcrease the heat and bring to the boil. Simmer for 8-10min , stirring constantly to prevent the caramel from sticking. Remove from the heat and stir in the chopped chocolate. Once smooth, pour the caramel over the flapjack and level with the back of a spoon. Sprinkle the salt flakes over then cover with another piece of greaseproof paper and gently press the salt into the caramel surface. Allow to set and cool then cut into finger slices. They look Ab Fab delicious! We must give them a go! yum! these look super tasty. 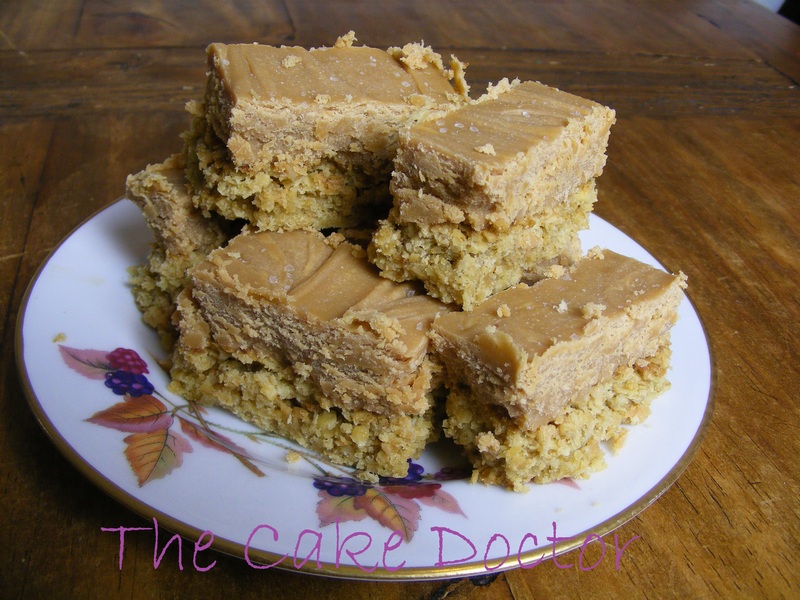 mmm I do love a good flapjack, and your addition of salted caramel looks delicious!